Quick response codes (QR codes) are two-dimensional codes capable of holding thousands of alphanumeric characters of information. They are similar to one-dimensional bar codes, except they can hold a lot more information. By scanning one of these codes with your iPhone, Android or any other camera-enabled smart phone, you can access digital content on the Web, activate an email, IM or other type of message, or connect your mobile device to a web browser. 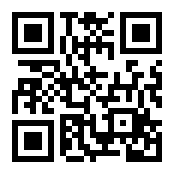 QR readers are standard features now on many smart phones, but there are several free apps if you need to download one. This technology, developed and popularized in Japan, has been around for about 15 years but is only now becoming popular in the US. Real estate agents are one of the most aggressive early adopters of the technology in the US, placing QR codes on For Sale signs and flyers, for example, to take the viewer on a video walk-through of a property. Put one on your business card. Create a short video about yourself, your agency, your service philosophy or offer to provide a quote … or anything else. Use it with direct marketing pieces. Point out the QR code and say, “See how much you can save on auto insurance.” When you use it on a postcard, you can overcome the limited amount of print real estate available by taking viewers to your website, where they can find out more. Use it on your next newsletter to send readers to your website for a special announcement, such as an upcoming webinar or a video presentation from the president of the agency. Maybe he wants to announce the agency’s 25th anniversary, announce the acquisition of another agency or let people know that the agency now has someone on staff who specializes in annuities and financial planning. Be creative. Put your website’s QR code alongside your logo the next time your print your company t-shirts or mugs. Try it yourself. It’s fun and people who use QR codes in their advertising claim they get much better than average response. The new year is well underway. I have now consumed the one pound box of See’s candy that I get from our bookkeeper every year, so I know. Of course I consume it as quickly as I can, so I don’t have to endure the constant guilt of knowing it’s bad for me. I don’t have my wife’s self-discipline; she can nurse a 3-ounce chocolate bar over the course of a week. She also has other powers that are awesome beyond belief. 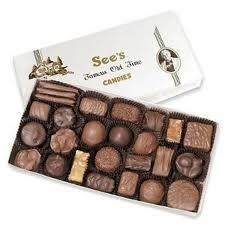 Obviously I love See’s candy — all kinds: dark or light, the nuts, the chews, the soft centers, all of them. But I don’t just like the taste of See’s candy; I like the principal of getting See’s candy — or something like it, especially at Christmas. The reason our bookkeeper knows this is because until a few years ago, before we brought most of our printing in-house, we used to give almost all of our printing business to one printer. Our annual printing expenditure with this printer was the equivalent of a good-sized roofer’s workers’ comp premium: in other words, sizeable. And every year when the fruit and wine and sausage and cheese baskets would arrive from other vendors, we received nothing from this vendor. Not even a Season Greetings card. I am not above expressing certain uncharitable thoughts from time to time and my bookkeeper, God love her, picked up on this. So now I get my See’s candy every year — from her. I’m not going to say that the reason we don’t use this printer any more is because of the candy. That would be ridiculous. But I do think that part of the reason I was inclined to consider alternatives to giving most of our print work to this vendor was that their inattention to this aspect of customer service slightly annoyed me. Do you think that your customers might be slightly annoyed with you if the only thing you ever send them is a renewal policy and invoice every year? Do you add any kind of value that is non-transactional? It doesn’t have to be a box of candy. A calendar, a newsletter — preferably print, since print just makes a better presentation — even a birthday card? Yes, you offer professional services and are always available to answer questions. My printer, too, did good work. If he hadn’t, we would have fired him long before we did. Your clients will fire you, too, if you don’t deliver professional service. One lesson we learn again and again — it’s the underpinning of the social media phenomenon — is that people want to be appreciated. It’s just part of providing good customer service. A calendar or newsletter won’t by themselves make your customers raving fans, but they can’t hurt. And you might avoid creating that slightly annoyed feeling that some of your less charitable clients, if they’re like me, might feel at times. Mark Your Calendar For The Relationship-Building Opportunity of the Season! With the summer weather just about over and kids going back to school, it’s time for insurance agent marketers to start thinking about — the holidays! Most retailers, including Walmart, Home Depot, Sears and Costco, have already started putting out their Christmas merchandise. For insurance marketers, the holidays don’t mean an opportunity to sell products people want to find under the tree on Christmas morning. No, the holidays are a sentimental time of year when we reflect on the importance of our relationships. And so it is a great time for you to focus on relationship marketing, when your primary goal is not selling a product but doing things that nurture the long-term commitment you’d like your customers to make to your agency. It costs five to ten times more to acquire new clients than to keep them, so relationship building is extremely important. You might want to think about sending a personal gift, like a food or wine basket, to your very special clients, especially those who give you referrals. Greeting cards are also appreciated and more affordable. But the holiday gift that’s hard to beat is the calendar. What’s better than a gift that reminds the viewer of you every day? Studies show that almost four out five people who receive calendars recall the name of the advertiser and remember the name of the product or service they sell. Again, about four out five people who receive calendars also plan to do business with the calendar advertiser in the future. Not every person who receives your complimentary calendar will put it on their wall, but studies show that the majority will and they appreciate the gift. One thing to bear in mind when you mail your calendar, keep the message focused on relationship-building and avoid the temptation to try to sell. Just let them know you appreciate their business and you hope this token of your appreciation will be helpful to them in the year ahead. By the way, Smart’s is pleased to partner with Direct Effect to bring our clients a wide range of custom calendars. Our newsletter shipments and invoices this month will include a brochure that illustrates dozens of calendar options you can choose from. If you didn’t get a brochure but would like one, please call Brian at 1-866-762-7879. You can also view a selection of our calendars if you click here. Place your order soon and avoid the rush. As I mentioned in my last post, a new study by the Promotional Products Association International (PPAI) on advertising calendars has proved that this venerable advertising medium is far from dead. In fact, it’s thriving. To paraphrase Mark Twain, the news of its death is premature — and maybe even completely out of the question. I’ll admit I’ve transitioned from using a daily paper planner to just storing my appointments in Outlook (I like the pop-up and audible reminders). But I still use my wall and pocket calendars in much the same way as the people in the survey seem to. When I want to quickly check a date, I don’t want the bother of having to open a window on my computer; I just look at the wall or my pocket calendar. I should also mention that a lot of people still don’t completely trust electronic devices because of power outages or battery drains. Many of the people in the survey also preferred a printed diary or daily planner because they like making notes and keeping track of things in print. Despite the ubiquity of computers and mobile devices, Post-Its show no signs of going away. 79% of respondents said they enjoy receiving complimentary calendars; only six percent said they would not keep a free advertising calendar. 76% of respondents reported that at least one of the calendars they have at work is an advertising calendar. 75.3% of advertising calendar recipients recalled the name of the advertiser and slightly more (77.3%) remembered the product or service. About the same number of people (77.6%) plan to do business with the calendar advertiser in the future. Given how pervasive the wall calendar is in the home and office environments, it seems that most people still rely largely, some even exclusively, on at least one print calendar, and they’re quite positive about the companies that advertise with them. The financial services industry seems to think so too. When asked to name the companies that gave them their calendars, 39% of the study respondents said insurance agencies! Only banks and financial institutions scored slightly higher, at 42%. Print Calendars, Still A Good Advertising Value For Insurance Marketers? It’s now confirmed that another print promotional tool has survived the electronic technology revolution. I’m talking about calendars. Whether it’s a wall calendar, wallet or magnetic cards or even desk or pocket planners, people still use print calendars. Undoubtedly, as an advertising tool, calendars still help you get the job done…every day of the year. In a study just published by Promotional Products Association International (PPAI), Calendar Usage In The Workplace, and a companion study, Calendar Usage In U.S. 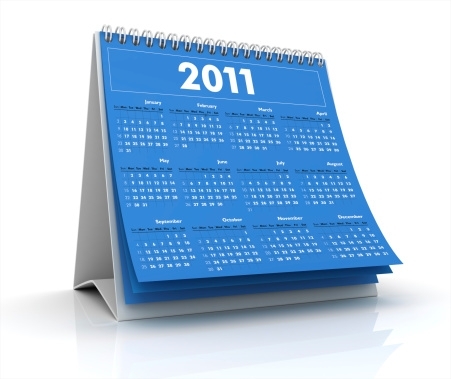 Households, the surprising news is that 79% of homes and 78% of businesses still have at least one printed calendar. In similar research done in 1981, the percentage was 98%. But considering the technological strides we’ve made in the past 30 years, calendar usage in homes and business is amazingly popular. Of the businesses surveyed (62% of which had less than $500,000 per year in sales), the office wall (64%) and common areas (32%) are the prime locations for the calendar. The office desk calendar is mentioned by 38% of respondents and the day planner by 24%. 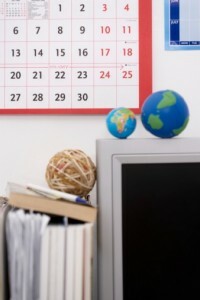 The average home has 3.12 wall calendars and the average office has 2.10 wall calendars. By contrast, in 1981 the numbers were 3.98 and 2.56, not much higher. Okay, so people still put calendars on their walls, but to what extent are PDAs, cell-phone calendars, Outlook calendars, the Google calendar and other electronic gadgets replacing printed calendars? The answer is somewhat surprising. For 67% of businesses, the primary calendar people use is print, with the wall calendar the most popular, followed by the desk calendar. Still, how effective are calendars as an advertising medium? Just because people use them, do they want to see an insurance agent’s name on the one they use? What are the benefits you might get from handing out a free calendar? I’ll report in my next blog post.